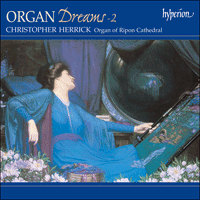 Continuing from the highly successful 'Organ Fireworks' series and the first volume of 'Organ Dreams' (CDA67060, released July 1998), this CD introduces more wonderful melodies from the organ repertoire. Some of the pieces were specially written for the instrument, such as Guilmant's Rêve and Wesley's Twelve Short Pieces and a Voluntary, and others are well-known in other incarnations, such as Barber's Adagio. In 1859 Théodore Dubois was chosen by César Franck to be maître de chapelle at the newly opened church of Ste Clotilde. He took up the post in 1861 on his return to Paris, after his time in Italy as winner of the Prix de Rome. Like so many other young composers he was given help and encouragement there by Liszt and was able to renew the acquaintance in 1866, when he assisted Franck at a private performance given for the distinguished visitor. In 1869 Dubois moved to the Madeleine in a similar role and eventually succeeded Saint-Saëns as organist in 1877, a post he later relinquished when he became Director of the Conservatoire. Although now remembered principally for a handful of organ pieces and, in France, for his textbooks on harmony and counterpoint, he was a prolific composer in many other fields. He never had a major success in the theatre, the ne plus ultra for any serious composer in Paris, but his works were performed at the Opéra-Comique and the Châtelet; he also produced many works for the concert hall as well as large quantities of church music. In Paradisum comes from his Douze Pièces Nouvelles of 1892 and is dedicated to Enrico Bossi. Heavenly harps, in the form of right-hand arpeggios, usher in a sweetly expressive tune on a soft reed stop which pursues its leisurely course over some twenty bars. After a brief chordal interlude the music of the opening returns, the melody now provided with its own harmonic support creating a particularly felicitous and idiomatic organ texture. Although now perhaps best known as the teacher of Benjamin Britten, Frank Bridge had an important reputation both as composer and conductor. There is an unmistakable Englishness about his music, yet he has never really been accepted into the pantheon of twentieth-century British composers. His most popular pieces are small scale, like the song Love went a-riding or the orchestral There is a Willow Grows Aslant a Brook; but it is in the bigger works such as Enter Spring, Oration and Phantasm where we find a more individual voice, which, while being completely aware of its national musical heritage, is also looking to the continent, in particular the extended harmonic palette of Alban Berg. The beautiful and rapt Adagio in E major, a great favourite for memorial services, is the second of Three Pieces published in 1905. Unlike his contemporaries Saint-Saëns, Widor and Dubois, Alexandre Guilmant was not interested in making his name as a composer in the fields of chamber and orchestral music, nor in the theatre, but concentrated his efforts almost exclusively on organ and choral works. Born into an organ-building family in Boulogne he was largely self-taught, apart from a brief period with the celebrated Lemmens in Brussels in 1860. He was one of the first to enjoy an international career as a recitalist, being particularly popular in Britain and the USA. His eight sonatas, a body of work equivalent to the symphonies of Widor, were written for his recitals both abroad and on the celebrated Cavaillé-Coll instrument at the Trocadéro in Paris. The Seventh Sonata, written in 1902, is described as a suite in six movements. The second and shortest – ‘Lento Assai’ – is subtitled Rêve and is a brief interlude of calm in an otherwise boisterous and extrovert work. After a series of unresolved seventh chords the songlike movement hovers between different states of consciousness, expressed in music which is sometimes stable and diatonic and at others shiftingly chromatic. Edward Elgar came into contact with the organ at an early age through his father’s duties as organist at St George’s Catholic Church, Worcester, and in his typically thorough way he taught himself to play from the tutors of Rinck and Best. In 1885 he succeeded his father in the post and it was probably during this time that he began to sketch the Vesper Voluntaries. In their final form they were one of the first fruits of his, in the event ill-fated, move to London from his beloved Worcestershire. In the autumn of 1889 he and his new and adored bride Alice moved into a house in Norwood, near the Crystal Palace. Here he could hear orchestral concerts more or less daily, an important feature in the process of his growth as a composer. It was a difficult period in his development; the eventual master of the symphony, concerto and the oratorio was just beginning to emerge from the provincial writer of salon pieces and light orchestral scores. His first major choral work, The Black Knight, was already sketched out and gently simmering inside his head, while the overture Froissart had been commissioned by the Three Choirs Festival for performance in September 1890. However, in spite of a few successes, he failed to make much headway and in 1891 the Elgars moved to Malvern, where he at last found the contentment that enabled him to blossom into the composer of the ‘Enigma Variations’ and all that was to follow. Early in January 1890, shortly after the move to London, Elgar sold the Vesper Voluntaries to the publishers Orsborn & Tuckwood for five guineas – hardly great riches but rather more generous than the terms offered by Novello & Co. at the start of their relationship with the composer – and they appeared as Book 26 of The Vesper Voluntaries for the Organ, Harmonium, or American Organ. They are designed to be played on a two manual instrument without pedals but Elgar provided indications where they could be used if available. The latent grandness of many of the ideas makes them eminently suitable for expansion onto a larger canvas. The set comprises eight voluntaries with an introduction, an interlude between the fourth and fifth numbers and a coda; although designed to be played separately the pieces make a thoroughly satisfying continuous sequence, full of characteristic melodic and harmonic touches. The use of the same theme in the introduction, interlude and coda binds the work together and Elgar already adopts the quasi-orchestral approach to organ writing which was to be such a feature of his magnificent Sonata in G major a few years later (recorded by Christopher Herrick on ‘Organ Fireworks VI’, Hyperion CDA66778). Herbert Howells was possibly one of the most self-effacing composers of the century, seemingly content to devote his energy to encouraging others through his teaching, in particular at the Royal College of Music and St Paul’s Girls’ School, rather than to promoting his own composing career. And yet he developed a style and language which are intensely personal and immediately identifiable. Although he spent only a short part of his working life as an organist he left a substantial body of music for the instrument, including two sets of Psalm-Preludes, four Rhapsodies and two Sonatas. Siciliano for a High Ceremony was written in 1953 and is one of his last works for the instrument. It has that lilting rhythm so typical of the old dance, but with three beats to the bar rather than the usual two or four. After a brief, harmonically enigmatic preamble the right hand plays a long-breathed melody marked to be played tenderly. This is immediately repeated with the addition of the pedals and subtle alterations in the harmony. From then on the piece takes off in a free-flowing rhapsodic way demonstrating Howells’ ability to spin seemingly endless melody from a few telling shapes. The most curious thing about this piece is that the high ceremony of the title was a wedding, possibly of an old flame, in St Giles Cathedral in Edinburgh. Clearly the composer felt the need to concentrate on the serious aspect of the occasion, rather than provide a piece of musical confetti. In any case, this is one of the composer’s most gravely beautiful and expressive works. The years 1841 to 1844 were remarkably productive for Robert Schumann, yielding a large number of songs, orchestral works and chamber music. In spite of this prodigious outpouring of masterpieces, including Dichterliebe, the first and fourth symphonies, the first movement of the Piano Concerto as well as the Piano Quartet and Quintet, he became increasingly depressed, feeling himself to be in the perpetual shadow of his wife’s career. In 1843 he took a position at the newly opened Leipzig Conservatory teaching piano and composition. However, by 1844 his nerves were in such a state that he suffered a complete breakdown and so, in December of that year, the whole family moved to Dresden. Schumann took with him a pedal attachment for his piano – he had first encountered the device at the Conservatory, where it was introduced as an aid for the organ students – and here he set about honing his contrapuntal skills. In 1845 he produced three sets of pieces for the pedal piano or organ: Six Studies in Canon Op 56, Four Sketches Op 58 and Six Fugues on B-A-C-H Op 60. Although his encounters with historic Silbermann instruments in 1841 kindled a desire to study the organ seriously – he keenly promoted the instrument to his students – this never actually came about and the writing in all of these pieces is somewhat pianistic. This is particularly so in the A flat major Study Op 56 No 4; the searing intensity of the melodic line, in canon at the fifth, is set against chugging chords, creating a texture which would not be out of place in one of his lieder. A more agitated middle section, combining rapid passagework with the characteristic rising motif from the main theme, is followed by a harmonically enriched reprise of the first section. Samuel Barber’s Adagio for Strings has become one of the most popular and frequently performed works of the twentieth century. Starting life as the second movement of his String Quartet in 1936, he transcribed it two years later for string orchestra. It was played in this form for the first time under Arturo Toscanini. Barber had been rather taken aback when the conductor, having expressed an interest in his music, returned the manuscripts of the Adagio and his First Essay for Orchestra without any comment. He later discovered that this was not a sign of rejection, but simply that Toscanini, whose memory was phenomenal, had no further need of the scores. The seemingly effortless invention of the Adagio displays his extraordinary gift for melody, perhaps not so surprising in a trained singer, as well as his ability to make a basically consonant harmonic style sound fresh and original. In August 1861 Franz Liszt left Weimar where, for the last thirteen years, he had been court conductor. After visits to Berlin and Paris he settled in Rome which was to be his home for the rest of his life. The Weimar years had been particularly productive ones for Liszt the composer and, in addition, as a conductor he had been tireless in promoting the music of others, particularly that of Wagner and Berlioz. The move to Rome was in part prompted by his wish to marry the Princess Carolyne Sayn-Wittgenstein, his mistress for the past fourteen years, but the Pope’s last-minute decision not to allow an annulment of her meaningless existing marriage put paid to this plan. The disappointment of this, as well as the devastation caused by the death of his daughter Blandine, meant that he produced little of substance in 1862. The music he did write, including the Variations on Weinen, Klagen, Sorgen, Zagen as well as the present work, evinces a troubled and brooding aspect showing a desire to search for a deeper sense of spirituality. The Evocation à la Chapelle Sixtine is akin to the operatic paraphrases for piano in that it takes other people’s music and reinterprets it in a thoroughly Lisztian way, although the writing here is obviously considerably more subdued than in those virtuosic essays. The music falls into four sections which metamorphose alternately the Miserere of Allegri and the motet Ave verum corpus by Mozart, both of which were in the repertoire of the Sistine Chapel Choir. The first and third sections, taking merely the essence of the Allegri, work it up into ever more tortured and searing climaxes and represent, in the composer’s words, ‘the misery and anguish of mankind’. This is contrasted with the second and fourth sections where, through the medium of Mozart’s exquisite motet ‘the infinite mercy and grace of God’ reveals itself in song. Samuel Wesley was widely regarded as one of the finest organists of his generation and yet he was never able to acquire a major post and spent most of his life in financial impoverishment, often having to rely on the assistance of friends and supporters such as Vincent Novello. When William Boyce visited the Wesley household in Bristol and heard the eight-year-old Samuel play, he said to his father “Sir, I hear you have an English Mozart in your house”. In 1778 they moved to London and he and his equally gifted brother, Charles, began to give a series of subscription concerts at their home in Marylebone. An injury to his skull, the result of an accident at the age of twenty-one, left him for the rest of his life subject to recurring bouts of depression and doubts about the validity of the music profession. And yet, in spite of all this adversity, his music, as demonstrated in these four short pieces, has a deftness and lightness of touch which betokens a much sunnier disposition. Samuel Wesley was a fervent advocate of the music of Johann Sebastian Bach, publishing an edition of the Well-Tempered Clavier as well as one of the Trio Sonatas, in an arrangement for three hands. English organs of the period rarely had an independent pedal board. The set of Twelve Short Pieces and a Full Voluntary from which these four little gems are taken was published in 1815 and is for manuals only. Numbers 8 and 9 acquired the titles of ‘Air’ and ‘Gavotte’ in an arrangement published by John E West in 1905. En 1859, Théodore Dubois se vit confier par César Franck la charge de maître de chapelle à l’église parisienne, nouvellement inaugurée, de Sainte-Clotilde – un poste qu’il prit en 1861, au terme d’un séjour en Italie consécutif à son prix de Rome. Comme tant d’autres jeunes compositeurs, il reçut l’aide et les encouragements de Liszt, avec lequel il put renouer, en 1866, quand il assista Franck lors d’un concert privé donné à l’intention de ce visiteur émérite. Devenu maître de chapelle à la Madeleine, en 1869, Dubois succéda finalement à Saint-Saëns, au poste d’organiste (qu’il occupa de 1877 à 1896, date à laquelle il devint directeur du Conservatoire). Quoique devant aujourd’hui sa célébrité à une poignée de pièces pour orgue (et, en France, à ses traités d’harmonie et de contrepoint), Dubois fut un compositeur prolifique en maints domaines. L’absence de grand succès au théâtre – le nec plus ultra pour tout compositeur sérieux à Paris –, n’empêcha pas ses œuvres d’être données à l’Opéra ­Comique et au Châtelet, et il produisit quantité de pièces de concert et énormément de musique d’église. In Paradisum, extrait de ses Douze Pièces nouvelles (1892), est dédié à Enrico Bossi. Les harpes célestes, sous forme d’arpèges à la main droite, introduisent une mélodie paisiblement expressive, sur un doux jeu d’anches, qui poursuit sa course nonchalante sur une vingtaine de mesures. Passé un bref interlude en accords, la musique de l’ouverture revient, la mélodie se voyant désormais offrir son propre support harmonique, source d’une texture d’orgue particulièrement heureuse et idiomatique. Bien que surtout connu pour avoir été le professeur de Benjamin Britten, Frank Bridge fut un compositeur-chef d’orchestre fort réputé – même s’il ne fut jamais véritablement admis au panthéon des compositeurs britanniques du XXe siècle, et ce malgré une musique marquée d’un sceau indubitablement anglais. Ses pièces les plus populaires sont celles à petite échelle, telles la mélodie Love went a-riding ou l’orchestrale There is a Willow Grows Aslant a Brook, mais ce sont ses œuvres de plus grande envergure, telles Enter Spring, Oration et Phantasm, qui nous donnent à entendre une voix plus individuelle – une voix qui, tout en étant consciente de son héritage musical national, regarde vers le continent, notamment vers la vaste palette harmonique d’Alban Berg. Le splendide et profond Adagio en mi majeur, l’une des pièces les plus appréciées lors des commémorations, est la deuxième des Three Pieces publiées en 1905. Contrairement à ses contemporains Saint-Saëns, Widor et Dubois, Alexandre Guilmant ne chercha pas à s’imposer comme compositeur de musique de chambre, de musique orchestrale ou de musique pour le théâtre, mais concentra ses efforts presque exclusivement sur les pièces pour orgue et les pièces chorales. Né dans une famille d’organiers, à Boulogne, il fut en grande partie autodidacte, hors une brève période où il reçut l’enseignement du fameux Lemmens, à Bruxelles, en 1860. Il fut l’un des premiers à jouir d’une carrière internationale de récitaliste – il fut particulièrement populaire en Grande-Bretagne et aux États-Unis. Le corpus de ses huit sonates pour orgue, qui équivaut aux symphonies de Widor, fut écrit pour ses récitals tant à l’étranger que sur le célèbre instrument de Cavaillé-Coll installé au Trocadéro, à Paris. Composée en 1902, la célèbre Septième Sonate est décrite comme une suite en six mouvements. Le deuxième mouvement (le plus court), « Lento Assai », sous-titré Rêve, est un bref interlude de calme dans une œuvre par ailleurs tumultueuse et extravertie. Passé une série d’accords de septièmes non résolus, le mouvement cantabile se meut entre différents états de conscience, exprimés dans une musique tantôt stable et diatonique, tantôt d’un chromatisme instable. Edward Elgar entra très jeune en contact avec l’orgue grâce à son père, organiste à St George’s Catholic Church (Worcester), et à la manière approfondie dont il apprit à en jouer seul, d’après les méthodes de Rinck et de Best. En 1885, il succéda à son père, et ce fut probablement à cette époque qu’il commença d’esquisser les Vesper Voluntaries. Sous leur forme finale, ils furent l’un des premiers fruits de son déménagement – en fin de compte malheureux – à Londres, ville pour laquelle il avait quitté son cher Worcestershire. À l’automne de 1889, il emménagea (en compagnie de son neveu et de son épouse adorée, Alice) dans une maison, à Norwood, près du Crystal Palace. Là, il put aller écouter plus ou moins quotidiennement des concerts orchestraux, qui concoururent grandement à son développement de compositeur. Mais ce fut une période difficile : il venait juste de quitter son statut d’auteur provincial de pièces de salon et de partitions orchestrales légères et n’était pas encore ce maître de la symphonie, du concerto et de l’oratorio que nous connaissons. Sa première grande œuvre chorale, The Black Knight, était déjà ébauchée et mûrissait doucement dans sa tête, cependant que le Three Choirs Festival donna, en septembre 1890, Froissart, l’ouverture qu’il lui avait commandée. Mais, nonobstant quelques succès, il ne parvint pas à beaucoup avancer et, en 1891, il s’installa, en compagnie de sa femme, à Malvern, où il trouva enfin le contentement qui lui permit de composer les ‘Enigma’ Variations et tout ce qui allait suivre. Au début de janvier 1890, peu après être arrivé à Londres, Elgar vendit les Vesper Voluntaries aux éditeurs Orsborn & Tuckwood, pour cinq guinées – guère une fortune, mais toujours plus que la somme proposée par Novello & Co au début de sa relation avec le compositeur –, et ils devinrent le volume 26 de The Vesper Voluntaries for the Organ, Harmonium, or American Organ. Le fait que tous aient été élaborés pour un instrument à deux manuels, sans pédales, n’empêcha pas Elgar de désigner les endroits où ces dernières pouvaient éventuellement être utilisées. Nombre d’idées sont douées d’un panache tel qu’elles se révèlent éminemment adaptées à un canevas plus important. Le corpus comprend huit voluntaries avec une introduction, un interlude entre les quatrième et cinquième numéros, ainsi qu’une coda ; bien que conçues pour être jouées séparément, ces pièces forment une séquence continue des plus satisfaisantes, regorgeant de touches mélodico-harmoniques caractéristiques. L’usage du même thème dans chaque introduction, interlude et coda unifie le tout et Elgar adopte déjà l’approche quasi orchestrale de l’écriture organistique qui devait empreindre sa magnifique Sonate en sol majeur, quelques années plus tard. Herbert Howells fut peut-être l’un des compositeurs les plus effacés de son siècle, préférant manifestement consacrer son énergie à encourager les autres au travers de son enseignement, notamment au Royal College of Music et à St Paul’s Girls’ School, qu’à promouvoir sa propre carrière. Il n’en développa pas moins un style et un langage intensément personnels et immédiatement identifiables. Même s’il ne passa qu’une brève partie de sa vie active comme organiste, il laissa un substantiel corpus de pièces pour orgue, dont deux ensembles de Psalm-Preludes, quatre Rhapsodies et deux sonates. La Siciliano for a High Ceremony – l’une de ses dernières œuvres pour orgue, écrite en 1953 – affecte ce rythme chantant si typique de la vieille danse, mais avec trois temps (au lieu des deux ou quatre habituels) par mesure. Passé un bref préambule, harmoniquement énigmatique, la main droite exécute une longue mélodie, à jouer tendrement et immédiatement reprise, avec ajout de pédales et d’altérations subtiles dans l’harmonie. Dès lors, la pièce s’envole d’une manière librement rhapsodique, qui démontre la capacité de Howells à filer une mélodie apparemment sans fin à partir de quelques formes éloquentes. Fait le plus curieux, la grande cérémonie du titre fut un mariage (peut-être d’un de ses anciens béguins) célébré à St Giles Cathedral (Édimbourg). De toute évidence, le besoin du compositeur de se concentrer sur l’aspect sérieux de la cérémonie prima sur sa volonté d’offrir des confettis musicaux. Quoi qu’il en soit, cette œuvre est l’une des plus expressives et solennellement splendides qu’il ait jamais composées. Les années 1841-1844 furent remarquablement fécondes pour Robert Schumann, qui produisit un grand nombre de lieder, d’œuvres orchestrales et de pièces de chambre. Malgré ce prodigieux jaillissement de chefs-d’œuvre – dont Dichterliebe, les Première et Quatrième symphonies, le premier mouvement du Concerto pour piano, les Quatuor et Quintette avec piano –, Schumann sombra dans une dépression de plus en plus profonde, se sentant dans l’ombre perpétuelle de la carrière de sa femme. En 1843, il enseigna le piano et la composition au Conservatoire de Leipzig, nouvellement ouvert. Mais, en 1844, il sombra dans une dépression totale et, en décembre, toute la famille s’installa à Dresde. Schumann emporta avec lui une attache de pédales pour son piano (il avait découvert ce dispositif au Conservatoire, où on l’avait introduit pour aider les étudiants en orgue) et commença d’affiner ses talents contrapuntiques. En 1845, il produisit trois corpus de pièces pour piano à pédalier ou orgue : Six Études, op.56, Quatre Esquisses, op.58 et Six Fugues sur B-A-C-H, op.60. Quoique ses rencontres avec des instruments historiques de Silbermann, en 1841, eussent éveillé en lui le désir d’étudier l’orgue sérieusement – il promut ardemment cet instrument auprès de ses étudiants –, il ne le fit jamais vraiment, et l’écriture de toutes ces pièces demeure quelque peu pianistique. Ce qui vaut surtout pour l’Étude en la bémol majeur, op.56 no4 : l’intensité fulgurante de la ligne mélodique, en canon à la quinte, est opposée à des accords haletants, créant une texture qui ne déparerait pas dans l’un de ses lieder. Une section centrale plus agitée, combinant des passages rapides au caractéristique motif ascendant du thème principal, est suivie d’une reprise, harmoniquement enrichie, de la première section. L’Adagio pour cordes de Samuel Barber est devenu l’une des œuvres les plus populaires et les plus souvent jouées du XXe siècle. Après en avoir fait le deuxième mouvement de son Quatuor à cordes (1936), Barber le transcrivit pour orchestre à cordes (1938) – forme sous laquelle Arturo Toscanini le créa. Barber fut un peu décontenancé lorsque le chef d’orchestre, qui avait manifesté de l’intérêt pour sa musique, lui retourna ses manuscrits de l’Adagio et son First Essay for Orchestra sans aucun commentaire. Mais il découvrit par la suite qu’il ne s’agissait en rien d’un signe de rejet : simplement, Toscanini, qui possédait une mémoire phénoménale, n’avait plus besoin des partitions. L’inventivité apparemment aisée de l’Adagio montre son don extraordinaire pour la mélodie (ce qui n’est peut-être pas si surprenant chez un bon chanteur), ainsi que sa capacité à rendre frais et original un style harmonique fondamentalement consonant. En 1861, Franz Liszt quitta Weimar, où il était demeuré chef d’orchestre de la cour durant treize ans. Après avoir séjourné à Berlin et à Paris, il s’installa à Rome pour le restant de ses jours. Les années weimaroises s’étaient avérées particulièrement fécondes pour le Liszt compositeur ; quant au Liszt chef d’orchestre, il s’était montré un infatigable promoteur de la musique des autres compositeurs, notamment Wagner et Berlioz. Il avait choisi Rome en partie parce qu’il souhaitait épouser la princesse Carolyne Sayn-Wittgenstein qui avait été sa maîtresse durant les quatorze années précédentes – mais, à la dernière minute, le pape décida de ne pas autoriser la princesse à divorcer, ruinant ce projet. Déçu et ravagé par la mort de sa fille Blandine, il ne fut guère productif en 1862. La musique qu’il écrivit alors, dont les Variations sur Weinen, Klagen, Sorgen, Zagen et la présente pièce, dévoile une âme troublée, broyant du noir, manifestant un désir de spiritualité plus profonde. L’Évocation à la Chapelle Sixtine est apparentée aux paraphrases opératiques pour piano en ce qu’elle prend la musique d’autrui pour la réinterpréter d’une manière intensément lisztienne, même si l’écriture est ici, à l’évidence, considérablement plus retenue que dans les paraphrases virtuoses. La musique est découpée en quatre sections métamorphosant tour à tour le Miserere d’Allegri et le motet Ave verum corpus de Mozart, pièces figurant toutes deux au répertoire du chœur de la Chapelle Sixtine. Les première et troisième sections, qui empruntent simplement l’essence de l’œuvre d’Allegri pour l’emmener dans des apogées toujours plus torturés et fulgurants, représentent « la misère et la détresse de l’humanité », pour reprendre les mots du compositeur. Ce qui contraste avec les deuxième et quatrième sections où, par le truchement de l’exquis motet mozartien, « la miséricorde et la grâce infinies de Dieu » se dévoilent en un chant. Bien que généralement considéré comme l’un des meilleurs organistes de sa génération, Samuel Wesley ne parvint jamais à obtenir un poste d’importance et passa l’essentiel de sa vie dans la misère pécuniaire, devant souvent compter sur le secours d’amis et de défenseurs, comme Vincent Novello. Quand William Boyce se rendit chez les Wesley, à Bristol, et entendit jouer Samuel, alors âgé de huit ans, il dit à son père : « Monsieur, j’entends que vous avez un Mozart anglais chez vous ». En 1778, la famille déménagea à Londres et Samuel commença de donner, avec son frère Charles, tout aussi doué que lui, des concerts par souscription, dans la demeure familiale, a Marylebone. Mais, accidentellement blessé au crâne à vingt et un ans, Samuel demeura toute sa vie sujet à de récurrentes crises de dépression et de doute quant à la validité de la carrière musicale. Pourtant, malgré toute cette adversité, sa musique recèle, comme l’attestent les quatre présentes pièces brèves, une maîtrise et une légèreté présageant une nature bien plus radieuse. Fervent apôtre de la musique de Johann Sebastian Bach, Samuel Wesley publia une édition du Clavier bien tempéré et des Sonates en trio, dans un arrangement pour trois mains. Les orgues anglais de l’époque possédaient rarement un pédalier indépendant. Aussi le corpus des Twelve Short Pieces and a Full Voluntary (publié en 1815), dont sont extraits ces quatre petits joyaux, est-il dévolu aux seuls manuels. Les numéros 8 et 9 reçurent les titres de « Air » et « Gavotte » dans un arrangement publié en 1905 par John E West. Im Jahre 1859 wurde Théodore Dubois von César Franck als Maître de chapelle der neu eröffneten Pariser Kirche Sainte Clotilde auserwählt; er trat das Amt nach seiner Rückkehr aus Italien an, wo er sich als Sieger des Prix de Rome aufgehalten hatte. Wie so vielen anderen jungen Komponisten wurde auch ihm die Hilfe Liszts zuteil, und er konnte die Bekannschaft erneuern, als er Franck 1866 bei einer Privataufführung assistierte, die der für den namhaften Gast gab. 1869 ging Dubois in ähnlicher Funktion an die Madeleine, und 1877 trat er die Nachfolge von Saint-Saëns als Organist an – auf einem Posten, den er 1896 aufgab, als er Direktor des Conservatoire wurde. Zwar ist er heute vorwiegend für eine Handvoll Orgelstücke (und in Frankreich für seine Lehrbücher über Harmonik und Kontrapunkt) bekannt, doch war Dubois auch auf vielen anderen Gebieten ein produktiver Komponist. Auch wenn ihm nie ein bedeutender Theatererfolg – in Paris das Nonplusultra für jeden ernsthaften Komponisten – vergönnt war, wurden seine Werke doch an der Opéra-Comique und am Théâtre du Châtelet aufgeführt; daneben schrieb er zahlreiche Werke für den Konzertsaal und große Mengen Kirchenmusik. In Paradisum entstammt seinen Douze Pièces Nouvelles von 1892 und ist Enrico Bossi gewidmet. Himmlische Harfen in Gestalt von Arpeggien in der rechten Hand leiten eine lieblich expressive Melodie in einer leisen Zungenstimme ein, die über etwa zwanzig Takte ihren gemächlichen Verlauf nimmt. Nach einem kurzen akkordischen Zwischenspiel kehrt die einleitende Musik zurück; der Melodie ist nun ihre eigene harmonische Stütze unterlegt, wodurch eine besonders gelungene und idiomatische Orgeltextur entsteht. Auch wenn man sich seiner heute meist als Lehrer von Benjamin Britten erinnert, genoß Frank Bridge seinerzeit einen ebenso hervorragenden Ruf als Komponist wie als Dirigent. Seine Musik hat etwas unverwechselbar Englisches, aber er hat dennoch nie so recht Eingang ins Pantheon englischer Komponisten des 20. Jahrhunderts gefunden. Seine beliebtesten Werke sind wie das Lied Love went a-riding oder das Orchesterstück There is a Willow Grows Aslant a Brook von bescheidenem Format, aber in seinen größer angelegten Kompositionen wie Enter Spring, Oration und Phantasm treffen wir auf eine individuellere Stimme – eine, die sich zwar ihres nationalen musikalischen Erbes bewußt ist, sich aber auch an Kontinentaleuropa orientiert, insbesondere an der erweiterten harmonischen Palette Alban Bergs. Das schöne und in sich gekehrte Adagio in E-Dur, das sich bei Gedenkgottesdiensten besonderer Beliebtheit erfreut, ist das zweite der 1905 veröffentlichten Three Pieces. Alexandre Guilmant war im Gegensatz zu seinen Zeitgenossen Saint-Saëns, Widor und Dubois weder interessiert, sich als Komponist von Kammer- und Orchestermusik einen Namen zu machen, noch wollte er am Theater reüssieren. Vielmehr konzentrierte er seine Bemühungen fast ausschließlich auf Orgel- und Chorwerke. Als Sproß einer Familie von Orgelbauern in Boulogne war er, abgesehen von einer kurzen Lehrzeit 1860 bei dem berühmten Jacques-Nicolas Lemmens in Brüssel, im wesentlichen Autodidakt. Er genoß als einer der ersten eine internationale Karriere als Konzertsolist und erfreute sich in Großbritannien und den USA besonderer Beliebtheit. Seine acht Orgelsonaten, ein Oeuvre, das sich mit den Sinfonien Widors messen kann, schrieb er für seine Recitals außerhalb Frankreichs und an der berühmten Cavaillé-Coll-Orgel im Pariser Trocadéro. Die Siebte Sonate entstand 1902 und wird als Suite in sechs Sätzen beschrieben. Der zweite und kürzeste Satz mit der Bezeichnung ‘Lento Assai’ trägt den Untertitel Rêve und ist eine kurze Ruhepause in einem ansonsten ausgelassenen und extrovertierten Werk. Nach einer Serie unaufgelöster Septakkorde bewegt sich der sangliche Satz zwischen verschiedenen Bewußtseinszuständen hin und her, umgesetzt in Musik, die mal ausgewogen und diatonisch, mal unstet chromatisch ist. Edward Elgar kam schon in frühem Alter durch die Tätigkeit seines Vaters als Organist an der katholischen Kirche Saint George in Worcester mit dem Instrument in Kontakt, und auf seine typisch gründliche Art brachte er sich mit Hilfe der Lehrbücher von Rink und Best selbst das Orgelspiel bei. 1885 übernahm er den Posten seines Vaters, und wahrscheinlich begann er auch um diese Zeit die Vesper Voluntaries zu skizzieren. In ihrer endgültigen Form waren sie die ersten Früchte seines – wie sich herausstellte, verhängnisvollen – Umzugs aus dem geliebten Worcestershire nach London. Im Herbst 1889 zogen er und seine frisch angetraute, innig geliebte Braut Alice in ein Haus in Norwood nahe dem Crystal Palace im Südosten Londons. Hier konnte er fast täglich Orchesterkonzerten lauschen, was seinem Heranreifen als Komponist überaus zuträglich war. Er befand sich in einem schwierigen Stadium seiner Entwicklung; der spätere Meister der Sinfonie, des Instrumentalkonzerts und des Oratoriums hatte gerade erst angefangen, sich aus dem provinziellen Verfasser von Salonstücken und leichten Orchesterpartituren herauszuschälen. Sein erstes bedeutendes Chorwerk, The Black Knight, war bereits im Entwurf vorhanden und nahm in seinem Kopf allmählich Form an, während die Ouvertüre Froissart vom Three Choirs Festival zur Aufführung im September 1890 in Auftrag gegeben worden war. Doch trotz einiger Erfolge gelang ihm der endgültige Durchbruch nicht, und 1891 zogen die Elgars zurück nach Worcestershire, ins malerische Städtchen Malvern, wo er endlich die Zufriedenheit fand, die es ihm ermöglichte, zum Komponisten der ‘Enigma’ Variations und alles nachfolgenden heranzureifen. Kurz nach seiner Ankunft in London verkaufte Elgar Anfang Januar1890 die Vesper Voluntaries für fünf Guineas an den Verlag Orsborn & Tuckwood – nicht gerade ein Vermögen, aber wesentlich großzügiger als die Beträge, die Novello & Co. dem Komponisten zu Beginn ihrer Geschäftsbeziehung bot –, und sie erschienen als Band 26 der Reihe Vesper Voluntaries for the Organ, Harmonium, or American Organ. Sie sind dazu gedacht, auf einem zweimanualigen Instrument ohne Pedale gespielt zu werden, doch hat Elgar angegeben, wo eventuell vorhandene Pedale eingesetzt werden können. Die latente Pracht vieler Ideen läßt sie zur Darbietung in erheblich größerem Maßstab durchaus geeignet erscheinen. Die Zusammenstellung umfaßt acht Orgelsoli mit einer Einleitung, einem Zwischenspiel zwischen Nummer vier und Nummer fünf sowie einer Coda, und obwohl die Stücke dafür konzipiert sind, einzeln gespielt zu werden, bilden sie eine ausgesprochen befriedigende Sequenz voller charakteristischer melodischer und harmonischer Details. Die Verwendung des gleichen Themas für Einleitung, Zwischenspiel und Coda bindet das Werk zum Ganzen, und Elgar bedient sich bereits des quasi orchestralen Herangehens an den Orgelsatz, das einige Jahre später ein so prägnantes Merkmal seiner großartigen Sonate in G-Dur werden sollte. Herbert Howells war möglicherweise einer der bescheidensten Komponisten des Jahrhunderts und offenbar damit zufrieden, seine Kräfte zur Förderung anderer einzusetzen, insbesondere als Lehrer am Royal College of Music und an der Mädchenschule St. Paul’s, statt seine eigene Karriere als Komponist voranzutreiben. Und doch entwickelte er einen Stil und eine Ausdrucksform, die zutiefst persönlich und unverkennbar sind. Obwohl er nur eine kurze Spanne seines Arbeitslebens als Organist tätig war, hinterließ er eine erhebliche Menge Musik für das Instrument, darunter zwei Serien von Psalm-Preludes, vier Rhapsodies und zwei Sonaten. Siciliano for a High Ceremony entstand 1953 und ist eines seiner letzten Orgelwerke. Es hat jenen rhythmischen Schwung, der für den alten Tanz so bezeichnend ist, allerdings mit drei Schlägen pro Takt statt der üblichen zwei oder vier. Nach einer kurzen harmonisch vieldeutigen Präambel erklingt in der rechten Hand eine langatmige Melodie, die laut Anweisung zartfühlend zu spielen ist. Sie wird unmittelbar wiederholt, mit zusätzlichem Pedal und subtilen Veränderungen der Harmonik. Von da ab gewinnt das Werk eine frei fließende Rhapsodik, die Howells Fähigkeit beweist, aus wenigen wirkungsvollen Grundelementen scheinbar endlose Melodien zu spinnen. Das seltsamste an diesem Stück ist, daß es sich bei der ‘high ceremony’ des Titels um eine Hochzeitsfeier handelt, möglicherweise die einer ehemaligen Geliebten in der Edinburger Kathedrale St. Giles. Dem Komponisten war es eindeutig darum zu tun, den ernsthaften Aspekt der Zeremonie herauszukehren, statt bloß musikalisches Konfetti zu liefern. Jedenfalls ist dies eines von Howells’ ernstesten, schönsten und ausdrucksvollsten Werken. Die Jahre 1841 bis 1844 waren für Robert Schumann bemerkenswert produktiv und erbrachten eine große Zahl von Liedern, Orchester- und Kammermusikwerken. Trotz dieser gewaltigen Fülle von Meisterwerken, darunter Dichterliebe, die Erste und Vierte Sinfonie, der erste Satz des Klavierkonzerts, das Klavierquartett und -quintett, litt er zunehmend an Depressionen und meinte, stets im Schatten der Karriere seiner Frau zu stehen. 1843 trat er am neueröffneten Leipziger Konservatorium einen Posten als Lehrer für Klavier und Komposition an. Doch schon 1844 waren seine Nerven derart zerrüttet, daß er einen Zusammenbruch erlitt, woraufhin die ganze Familie im Dezember des Jahres nach Dresden umzog. Schumann nahm eine Pedalvorrichtung für sein Klavier mit (das Gerät war ihm erstmals am Konservatorium begegnet, wo es als Lernhilfe für Orgelschüler eingesetzt wurde) und ging daran, sich im Kontrapunkt zu üben. 1845 schrieb er drei Gruppen von Stücken für Pedalklavier oder Orgel: Sechs Studien für den Pedalflügel Op. 56, Vier Skizzen für den Pedalflügel Op. 58 und Sechs Fugen über den Namen B-A-C-H Op. 60. Obwohl die Begegnung mit historischen Silbermann-Instrumenten 1841 in ihm das Bedürfnis weckte, sich ernsthaft dem Orgelstudium zu widmen – er empfahl das Instrument nachdrücklich seinen Studenten –, kam es nie wirklich dazu, und die Stimmführung sämtlicher Stücke wirkt eher pianistisch. Das gilt in besonderem Maß für die Studie in As-Dur Op. 56, Nr 4; die glühende Intensität der Melodielinie mit ihrem Kanon in der Quinte ist gegen gleichmäßig pochende Akkorde gesetzt, so daß ein Gewirk entsteht, das auch in einem seiner Lieder nicht fehl am Platze wäre. Auf einen lebhafteren Binnenabschnitt, der schnelles Passagenwerk mit dem charakteristischen ansteigenden Motiv aus dem Hauptthema verbindet, folgt eine harmonisch angereicherte Reprise des ersten Abschnitts. Samuel Barbers Adagio for Strings ist eines der beliebtesten und meistaufgeführten Werke des 20. Jahrhunderts geworden. Es begann sein Dasein 1936 als zweiter Satz seines Streichquartetts, doch bearbeitete Barber es zwei Jahre später für Streichorchester. In dieser Form wurde es erstmals von Arturo Toscanini aufgeführt. Der Komponist war zunächst ziemlich betroffen, als der Dirigent, nachdem er Interesse an Barbers Musik bekundet hatte, die Manuskripte des Adagio und des First Essay for Orchestra kommentarlos zurückschickte. Später erfuhr er, daß dies keineswegs ein Zeichen von Ablehnung war, sondern schlicht bedeutete, daß Toscanini, der ein phänomenales Gedächtnis hatte, die Partituren nicht mehr benötigte. Der scheinbar mühelose Einfallsreichtum des Adagio zeugt sowohl von Barbers außergewöhnlicher melodischer Gabe, die bei einem ausgebildeten Sänger vielleicht nicht gar so überraschend ist, als auch von seiner Fähigkeit, einen im Grunde harmonisch konsonanten Stil frisch und originell klingen zu lassen. Im August 1861 verließ Franz Liszt Weimar, wo er dreizehn Jahre lang als Hofkapellmeister gewirkt hatte. Nach Aufenthalten in Berlin und Paris ließ er sich in Rom nieder, das für den Rest seines Lebens seine Heimstatt werden sollte. Die Weimarer Jahre waren für Liszt als Komponisten besonders ertragreich gewesen, und daneben hatte er als Dirigent unermüdlich die Musik anderer Komponisten gefördert, insbesondere die von Wagner und Berlioz. Der Umzug nach Rom verdankte sich teils seinem Wunsch, die Fürstin Caroline von Sayn-Wittgenstein zu heiraten, die seit vierzehn Jahren seine Lebensgefährtin war, doch das Vorhaben scheiterte daran, daß der Papst in letzter Minute entschied, der Fürstin den Ehedispens vorzuenthalten. Die Enttäuschung darüber sowie die verheerende Wirkung, die der Tod seiner Tochter Blandine zeitigte, führten dazu, daß Lizst 1862 wenige Werke von Substanz schuf. Die Musik, die er schrieb, darunter die Variationen über die Kantate ‘Weinen, Klagen, Sorgen, Zagen’ und das vorliegende Werk, offenbart einen unruhigen, grüblerischen Aspekt seines Schaffens und verrät ein Streben nach vertiefter Spiritualität. Die Evocation à la Chapelle Sixtine ist insofern den Opernparaphrasen für Klavier verwandt, als sie fremde Musik aufgreift und sie in gänzlich Lisztscher Manier neu interpretiert, auch wenn die Ausführung hier naturgemäß erheblich gedämpfter ausfällt als in den virtuosen Klavierstücken. Die Musik teilt sich in vier Abschnitte auf, die abwechselnd das Miserere von Allegri und die Motette Ave verum corpus von Mozart, die beide zum Repertoire des Chors der Sixtinischen Kapelle gehörten, einer Metamorphose unterziehen. Der erste und dritte Abschnitt übernehmen von Allegri lediglich die Essenz, verarbeiten sie zu immer schmerzlicheren und ergreifenderen Höhepunkten und stellen, wie der Komponist selbst meinte, das Elend und die Qualen der Menschheit dar. Im Gegensatz dazu stehen der zweite und vierte Abschnitt, in denen sich vermittels Mozarts exquisiter Motette die unendliche Barmherzigkeit und Gnade Gottes in Gesang manifestieren. Samuel Wesley war allgemein als einer der besten Organisten seiner Generation angesehen, doch gelang es ihm nie, einen bedeutenden Posten zu ergattern, so daß er den größten Teil seines Lebens in finanziellen Nöten verbrachte und oft auf die Hilfe von Freunden und Förderern wie Vincent Novello angewiesen war. Als William Boyce den Wesleyschen Haushalt besuchte und den achtjährigen Samuel spielen hörte, sagte er zu dessen Vater: ‘Mein Herr, wie ich höre, beherbergen Sie einen englischen Mozart.’ 1778 zog die Familie nach London um, und Samuel und sein ebenso begabter Bruder Charles begannen in ihrem Haus im Stadtteil Marylebone Subskriptionskonzerte zu geben. Eine Schädelverletzung, die er sich mit einundzwanzig Jahren bei einem Unfall zuzog, bescherte ihm bis ans Ende seines Lebens immer wiederkehrende Anfälle von Depression und Zweifel an der Gangbarkeit der Musikerlaufbahn. Und doch besitzt seine Musik, wie die vorliegenden vier kurzen Stücke beweisen, trotz aller Widrigkeiten die Gewandtheit und Unbekümmertheit eines viel sonnigeren Gemüts. Samuel Wesley war ein leidenschaftlicher Fürsprecher der Musik Johann Sebastian Bachs; er gab eine Edition des Wohltemperierten Klaviers ebenso wie eine der Triosonaten in einem Arrangement zu drei Händen heraus. Englische Orgeln hatten zu jener Zeit nur selten eine unabhängige Pedaltastatur. Der Band mit dem Titel Twelve Short Pieces and a Full Voluntary, dem diese vier kleinen Glanzstücke entnommen sind, wurde 1815 veröffentlicht und ist für Manual allein gedacht. Die Nummern 8 und 9 haben in der von John E West 1905 veröffentlichten Bearbeitung die Titel ‘Air’ und ‘Gavotte’ erworben. The case of the ‘Father’ Schmidt organ must have included the unique, carved wooden hand, which is located in the promontory woodwork at the base of the East side of the organ case. The hand, which relayed the beat to the choir, was movable by a foot-lever built in to the organ console when it was sited on the east side of the choir screen. Before the Ripon Minster became the Cathedral Church of the newly formed Diocese in 1836, the choral services were held in the Choir. But after this time, because more services were held in the Nave, accompanying from the console site on the East side of the organ proved rather difficult. For this reason the console was sited on the South side of the organ in the new T C Lewis instrument of 1878. The old wooden hand is still movable via a lever within the organ loft, although it is not connected directly to the organ console. The present organ was built by T C Lewis of Brixton in 1878 and comprised 49 ranks, of which four were retained from the previous organ by ‘Father’ Schmidt in 1690 (three stops are retained in the present instrument). The case, designed by Sir Gilbert Scott and constructed by Thompsons of Peterborough, was installed at the same time. In 1902 Hill and Son of London provided a new console, replaced the action and revoiced the reed stops. Harrison & Harrison of Durham made modifications from 1912 to 1926, including revoicing all the stops, the addition of the Solo Organ, and some modifications to the West case. Subsequently Harrison & Harrison maintained the organ as follows: in 1963 several stops were added to the Choir Organ and the Pedal Organ, bringing the organ to almost its present specification of 59 speaking stops and 16 couplers. Other slight tonal additions and replacements were made in 1972 and in 1986 the Solo Orchestral Trumpet (horizontal) was added. During an overhaul in 1987/88 a new eight-level memory was installed for the general pistons and in 1996 the coupler system was replaced with solid state components and eight memories were added for the departmental combination pistons, replacing the push-button setter-board previously used. There are 3482 pipes ranging in length from 32 foot to 0·58 inches long. I am indebted to Robert Marsh for his research in to the history of Ripon Cathedral organ as found in his booklet Ripon Cathedral - A Short History of the Organs (1994).